Our halls were festive today as students and staff showed up wearing their ugliest holiday sweaters after our Student Government launched Whittier's first Ugly Holiday Sweater Day. Those who participated were asked to make a minimum donation of $1 to enter the Ugliest Holiday Sweater Contest. The money will go toward our Holiday Fund, which is being used to buy holiday gifts for 72 Whittier families. 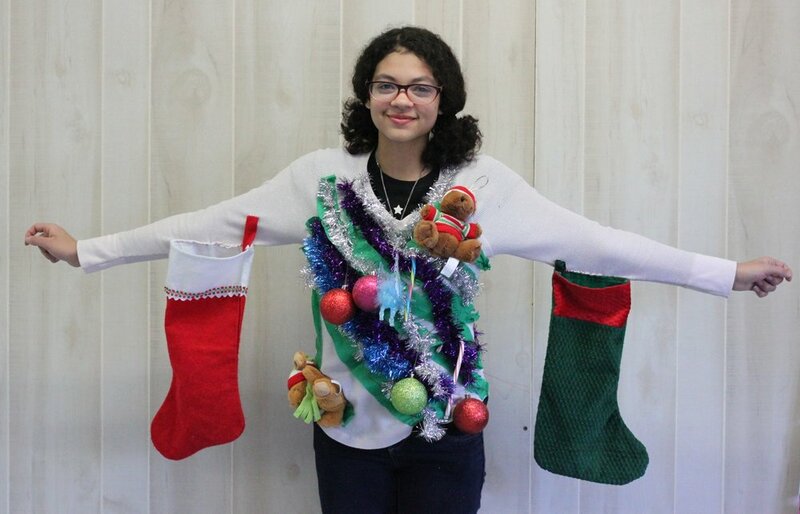 There were many ugly sweaters, but the winner's outfit was homemade and unique. Ronna Burroughs, a sophomore who studies Marketing, created a Christmas tree on a sparkly white sweater using tinsel, garlands, colorful streamers and ornaments. Her outstretched arms were a fireplace mantle with a stocking hanging from each side. "I was hoping I'd win," she said. She will receive a Whittier Tech sweatshirt from the school store.